ABOUT THE CONTENTS OF THIS TEXT: The information or advice that I write on this Site have been taken from my own experience, or from my own knowledge/research. These texts are offered in the hope that it may be useful to you. Please use your discrimination and judgement in utilising this material. If something rings true to you, fine! If something does not resonate, please, leave it alone! The pipe is 10 mm diameter. The copper coupling, for joining the two extremities (for the soldering), is also 10 mm diam. The total diameter of the tube ring, when finished, is about 80 cm diameter. (It has to be flat on the table, at approximately 20 cm from the edge of the table). As we were not yet fully developed in mediumship, once (in June 2002), we received the message from the spirit scientist Allen CATHISTOK, (a Norwegian who lived in OSLO, and who died 90 years ago) to build a ring with a microbore copper pipe of 10 mm diameter. At this time, we did not know what our spirits team had in mind. The first ring we built had the same diameter as the round solid pin wood table which is in our experimental room. The ring was laying flat on the table. Few days after, some friends visited us, and we were discussing. As we sat around the table, inadvertently, three of our visitors had their hands on the " Copper Hula Hoop", while talking. Suddenly, to our surprise, the ring began to move. As if we were hypnotized, we watched this phenomena. "It is normal, John is a physical medium! The ring must use his energy from his solar plexus". Immediately, the ring came straight on me, and banged into my stomach, then it moved and banged also into the sitter next to me, then it went again on the other sitters' solar plexus. 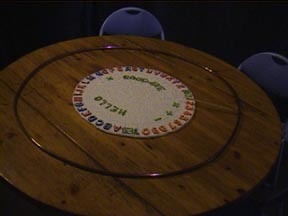 The ring was trying to tell us that it was actually using the energy of every body around the table! The ring was answering intelligently to my comment! During one hour, we were watching, amazed, at this ring moving by small rotations. We just kept gently our fingers on the ring, as if our fingers were transmitting energy electrodes, while the ring was sliding under our fingers. When we stopped using it, we discovered that the ring was completely distorted: it was no more laying flat on the table. We understood, then, that it was to make bangs/knocks on the table to answer "YES" and "NO" to our questions. It was evident that our spirit partners wanted to communicate with us by the intermediary of the ring. Then, for the next séance, John shortened the diameter of the ring because the ring had a tendency to go out of the table. 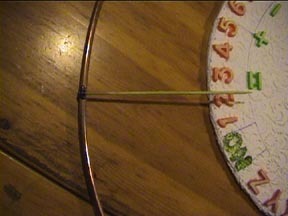 Now its dimension is approximately 80 cm diameter (to be at approx.20 cm from the edge of the table). My husband glued a wood skewer for BBQ on it, as a pointer (23 cms) , and I built a round board, made in polystyrene, with magnetic letters and figures (I found them in a toys shop) glued on it, to place it in the middle of the table. We filed the joint flat, so it would not catch on the table. They are the same scientific spirits and guides who are showing their faces on our screen while we are experimenting ; they are sharing their knowledge through our mediums, and are communicating with us through our Copper Ouija also. We understood also, from this experience, that it was us having good wine at lunch who have attracted him... That is why it is important to practice with the copper Ouija, before having any meal or any alcohol, to get valid representative. Something else that we have discovered is that, during the day, it is mostly the spirits children who are communicating. Our adult spirit friends asked us to communicate with then at 19:00. Another observation: the energy of the adult spirits is more powerful than the spirit children's. From the rotation speed, one can guess if it is an adult or a child speaking. 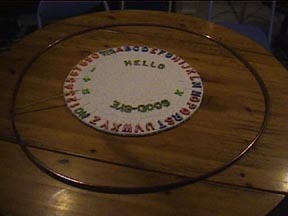 The copper ring moves around the table, by small rotations, in order to point on the required letter. The best condition is when four persons are sitting, to increase the energy. When the energy begins to be transmitted in the copper tube to be stored, the feeling is like subtle prickling on the back of top of the hands. The spirits are communicating during approximately 45 minutes, then they leave us. The experiments with the copper tube Ouija are important because one can fully understand, and with the simplest way, the notion of energy: ours, as we are made of atoms with protons/neutrons (the part which gives density), and electrons (which give the cold or warm feeling), and our spirit partners one. They have always affirmed that they were composed of electricity and light. Copper is a conductible material, as gold or silver, but less expensive. It is an experiment from the domain of physical phenomenas which shows, as well as the classical utilization of ectoplasm for materialisations, how the spirits can create phenomena, with the energy coming from our physical bodies. In order to get enough "stored" energy in the tube, for the spirits to make the ring moving, 3 to 5 minutes of waiting is necessary. Our procedure is: waiting that the ring moves, then asking the name of the speaker, and if it is an unknown or unusual spirit, we try to find out if this spirit has something interesting to communicate. If it is not the case, (as the séance will late only 45 minutes), we try not to loose time, and we demand for a guide who would be able to answer to a given topic (because our spirit partners do not know in advance what will be our questions ). The spirit visitor make us waiting, then, for about 10 to 15 seconds in order to look for the appropriate guide. To call for a family member, we proceed the same way. At each change of speaker, in the same séance, we get a new "HELLO" which signals a new person. They often use abbreviations. As, for example, "Q" which means "Have you a question? ", "N" for "NO", "Y" for "YES", etc... they can write our first names with abbreviations also (the first letter or the two first letters). Sometimes, if we have already guess a long word before they have finished to write it, they will not finished writing it. We make them confirm a letter, if the pointer has stopped in the middle of two letters. We are using a mini-disc recording machine, with an omnidirectional microphone, to avoid letting go of the ring; this enables us to remember all the messages. we repeat verbally and loudly each pointed letter, and we say : "OK! go ahead!" this last point is important in order to give the confirmation we have understood, and to encourage them to continue. Our spirit speakers are communicating in French and in English, according to their nationality. When we have asked a quite complicated question, they may take some seconds, staying quite, in order to consult the members of their group. Then the rotation starts again, and they give us their answer. Someone asked me : « About the copper ring, how the attendees have to hold the copper circle in order not to be in the way of its rotations ?, or do we have to leave it on the table, without touching it ? ». Yes ! your fingers, using both hands, must rest lightly on the ring all through the session. Put your finger tips on the copper ring, without resting heavily on it, in order to let it slide under all the attendees fingers. You must not impeach its movements ; you must keep your two hands apart, separated by 6 inches approximately, in front of you. For the séance with Ouija Board, the type of chairs is important. You need to sit on SOLID WOOD chairs, without cushions. Don’t use chairs covered with fabric, as this type of chairs absorbs the energy before it reaches its goal, on the table. You can use also upright plastic stacking chairs, as plastic isolates. Very smooth SOLID WOOD table is better also.